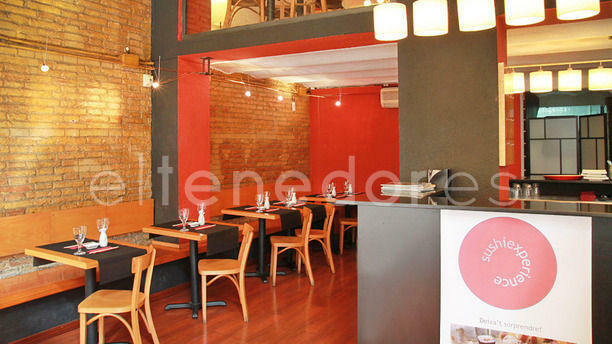 "Enjoy all types of traditional sushi and fusion in a minimalist space with dining room and sushi bar. Located in privileged Casanova Street, the restaurant Sushibo of Barcelona is ideal both for business lunches and dinners for friends. Prepared in an original way, served at the table and made in front of the diner, the sushi is the main host of this restaurant in l'Eixample. Its menu is very varied and the excellent quality of the ingredients, unbeatable. In addition, this establishment offers any type of Japanese cuisine with Mediterranean influences. Sushibo offers you also the Sushi experience for 2 persons for € 38. Let yourself be surprised and enjoy an assortment of 20 creative sushi pieces especially created for you and your partner." The quality is lower than the average sushi restaurant in Barcelona. Maki's are normal, and some of those contains only the smell of Foie. Good Atún Tartar in the other hand. Muchas gracias por su valoración y comentarios. la opinión de nuestros clientes es muy importante para nosotros. Nos estimula y ayuda a mejorar. esperamos verles de nuevo, muy pronto! Muchas gracias por su valoración y comentarios. La opinión de nuestros clientes es muy importante para nosotros, Nos estimula y ayuda a mejorar. Esperamos verles de nuevo muy pronto. Food was great but the service was reaaally slow. Muy lentos sirviendo. Resto normal.